B. Four (4) rustic-rustic cabins, impeccably clean, each with two (2) double beds, and modern amenities...wall fans, free in/out transfer from/to Tela bus station, free wi-fi, free cell phone, one for each Cabin; private bathroom with hot shower and hair dryer; all cabins are built around a tropical garden, right on the beach and only 30 yards from the sea foamy waves. 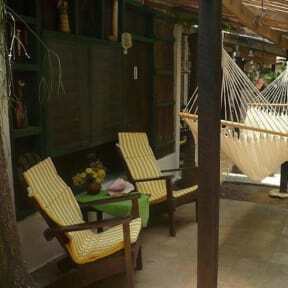 This typical and natural Bed & Breakfast is the perfect hideaway in the Caribbean Honduras coast. We are not a downtown hotel! we are definitely off-the-beaten-tourist-path, our guests experience the 'simple living style on the beach' mingling with the natives. 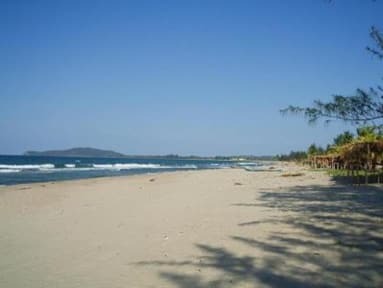 Ideal for honeymooners, nature lovers and family reunions. If you really want, or need, to immerse yourself in a peaceful, quiet and safe environment, this is the place to come for a Caribbean hammock relaxing at spectacular sunsets while enjoying nature for a true stress-free vacation. No, we don't have fancy decor, high-energy Disco nor elegant Bars, neither traffic lights, thousands of tourists, roaring airplanes. We do have lots of time to read a good book and many more hours to prepare ourselves for a daily mouth-watering fish and seafood encounter with our own creations at La Banana restaurant, bare-foot lunch on the beach and intimate candle light dinners. Freshly squeezed tropical fruit juices, local pilsner beer, Caribbean rums and Chilean wines to complete the experience! We also have available All Inclusive Plans.